Can Ronny Chieng and a new generation of comedians rekindle a University tradition that began with Barry Humphries? He pauses a beat. “Don’t they know they can download that stuff for free?” Then he recounts a row with his girlfriend about sexist US rapper Kanye West. While Chieng’s law degree from the University of Melbourne is a rich source of material for his on-stage persona, his University background has further significance. 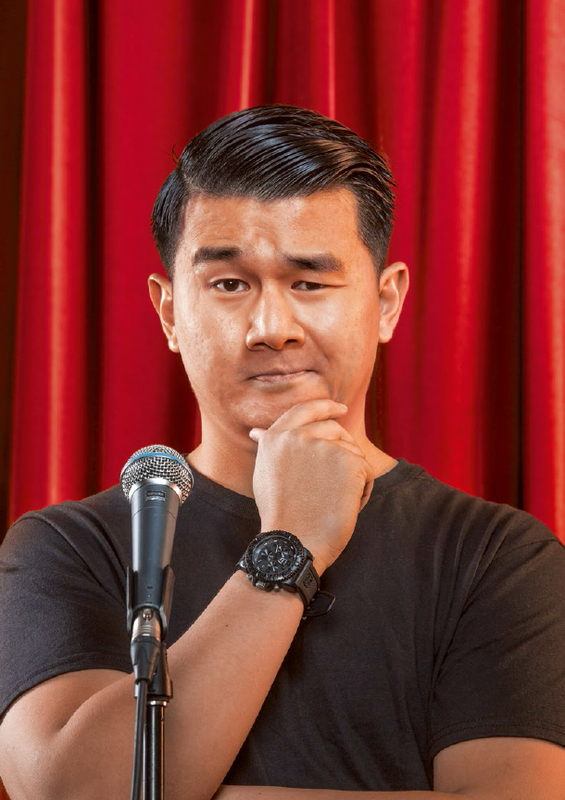 Born in Malaysia and educated in the US and Singapore, Chieng is one of the brightest young comics in the country, a stand-up who has garnered rave reviews at comedy festivals from Melbourne to Montreal and Edinburgh, the UK comedy site Chortle praising his “comic skills, academic brilliance and all-round credentials to make you laugh”. Chieng is now parlaying that success into appearances on television shows such as Dirty Laundry Live, The Agony of Modern Manners, It’s a Date and Have You Been Paying Attention? This brilliant career began on the University campus, where Chieng won a comedy competition and produced the famous Law Revue. His path also suggests a possible revival of the great tradition of previous decades of student revues as a nursery for major stage and TV comedians. For Melbourne this tradition began on September 8, 1953, when the University’s Dada Surrealist Art Group produced the lunch-hour revue Call Me Madman, starring an extrovert arts student. Barry Humphries AO CBE (LLD 2003) later appeared in a 1955 Union Theatre Repertory Company revue, for which he created a talkative housewife character named Edna Everage. Later stars of University revues loomed large in the Australian comedy scene – both live and on TV – from the early ’80s. Hit TV comedy shows such as Australia You’re Standing In It (1983-84) were performed and written by comedians Rod Quantock, Mary Kenneally (BA(Hons), LLB 1972, St Mary’s College), Steve Blackburn and Alan Pentland (BArch 1978), all from the School of Architecture’s famous Archi Revue. Kenneally is now working on a research project for the University’s Centre for Cultural Materials Conservation that will document both the seminal role of Archi Revue performers and the role of women in the history of Australian comedy. The cult TV comedy The D-Generation (1986-87) starred a crop of comics, including Rob Sitch (MB BS 1987), Santo Cilauro (BA 1983, LLB 1986) and Tom Gleisner (BA 1983, LLB 1986), who first worked together on University Law Revues in 1982 and 1983 when they produced the hugely successful Legal Aids: No-One is Immune. Comic and radio host Libbi Gorr (the former Elle McFeast; BA 1986, LLB 1987) auditioned for the 1984 revue Screw Loose and felt intimidated by the “private school ponytails and the handsome private school boys” until she met “a chubby girl in a big fluffy jumper” – Magda Szubanski. By 1993 Sitch, Cilauro, Gleisner and Jane Kennedy had formed Working Dog, the company behind TV series such as Frontline and movies such as The Castle and The Dish. This year they shifted their attention to the stage, launching their play The Speechmaker at the Melbourne Theatre Company. Another significant figure was Steve Vizard (LLB 1980), who made his debut in the 1976 Archi Revue, wrote for the 1977 Law Revue and performed in the first Melbourne Comedy Festival in 1987. He went on to create the comedy shows Fast Forward and Full Frontal, host his own nightly comedy talk show and set up the TV production house Artist Services. This rich association between the University and comedy has looked under threat in recent times, with most students so busy with part-time work they have little energy to indulge in such extracurricular campus activities. One bright spot has been the career of former Melbourne psychology student Lawrence Leung (BA, BSc 2001), assistant director of the 1997 uni arts review The Phantom Grimace – where he worked with fellow students Courteney Hocking (a comedian and writer) and Kate McCartney (a comedian and actor). And now there’s Chieng, who arrived at the University of Melbourne knowing nothing of its extraordinary comic tradition, or its apparent decline. With Chieng now one of Australia’s busiest comics, it’s hard to imagine him as the hesitant law student who regularly signed up for auditions and then backed out – once even making it as far as the waiting room before slinking away. In 2009 (the year he graduated with a Bachelor of Laws and Bachelor of Commerce), he put his name down as an entrant for the Campus Comedy competition for the third year in a row. This time he went through with it – and won. He still has the tape – “pretty rough stuff, not for polite company; a bit about race, a bit about being mugged, and dating” – and plans to put it on his upcoming DVD. The win gave him the confidence to tackle gigs off-campus. Unable to find a job as a lawyer, he devoted himself to comedy and was runner-up in the 2010 Melbourne International Comedy Festival’s national RAW Comedy competition, staged at the Melbourne Town Hall. Winning the 2012 festival’s Best Newcomer Award was his big break. He also appeared that year at the Montreal Festival, but then went part-time as a comic to complete his articles with a Melbourne law firm. Chieng believes his legal training has contributed to his skills as a stand-up. “It helps with the way you can argue your point of view,” he says.